Mind Candy CEO Michael Acton Smith came to my office today to tell me about Moshi Monsters, his company’s virtual world for kids that is signing up a new member every second. Moshi Monsters was his “last roll of the dice” to save his virtual worlds startup in 2008, and it worked. Moshi Monsters is up to 35 million registered users, with about 7 million of those active every month, says Smith. And it is projected to generate $100 million this year from a combination of subscriptions and gross retail merchandise sales. The site is geared towards kids between 5 to 12 years old. Each kid gets a monster pet and a room that can be decked out with virtual goods. But instead of trying to create “just another bloody virtual world,” Smith wanted it to be more like a safe social network. “Instead of copying Club Penguin,” he says, “we focused more on Facebook and tried to re-imagine that for kids.” There is pin board where friends can leave messages and a news feed, but there are also games, quizes and virtual world activities. The penny-drop moment for us was that kids like to share and show off online just as much as adults do,” he says. “If we could create the safe place online, we could create Facebook for kids.” In the video above, Smith explains his strategy and gives me a brief tour of the site. 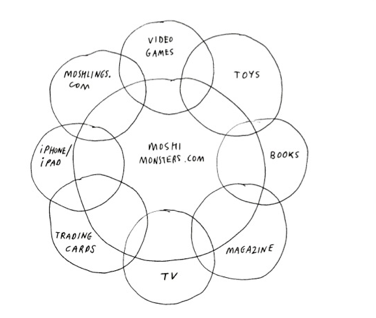 Moshi Monsters started in the UK, where Mind Candy is based, but now the U.S. is its biggest market. It makes money off of subscriptions ($50 a year to unlock different levels and get extra powers), but there are also toys and today it even launched a magazine for kids, Moshi Monsters Magazine (print’s not dead!). Smith wants to create a mini media empire from the little monsters, with plans to develop video games, TV shows, books, and iPhone/iPad apps. In the clip below he demonstrates the first Moshi Monster iPhone app, which gives you a Moshi Monster mouth that moves as you speak.